Flawless Fusion Ultra-Longwear Concealer is rated 4.5 out of 5 by 51. You can revel in having a flawless face with the help of Laura Mercier Flawless Fusion Concealer. The lightweight formulation helps to smooth out fine lines, mask dark circles and conceal other skin imperfections. The concealer helps you to create a flawless look and can be used every day without worries about ill effects. It contributes to a smooth, soft, and long-lasting natural appearance, being infused with skin-friendly ingredients that help to hydrate the skin, leaving it looking radiant and healthy. 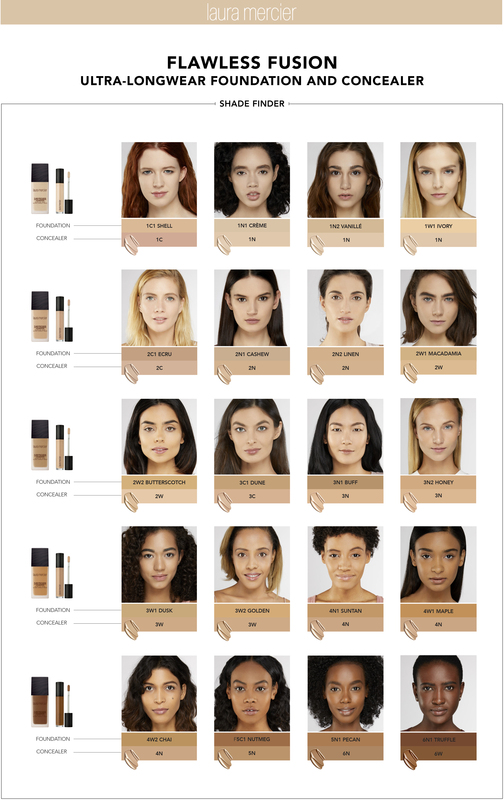 The concealer comes with Skin Fusion Technology, which helps to ensure it is impervious to perspiration, humidity, and water. It will stay put for up to 12-hours without streaking or wearing off. Hide skin blemishes and imperfections with ease by using Laura Mercier Flawless Fusion Concealer. It helps to hydrate the skin, giving it a natural and smooth appearance. Using the doe-foot applicator wand, dot Flawless Fusion Ultra-Longwear Concealer under eyes, over discolourations and imperfections, and onto any areas of darkness. The flexible, doe-foot applicator offers ultimate versatility and ease of application - Use the precise tapered tip for neat detail coverage in small spots around the nose or under the eyes, and the wider flat side to glide over larger areas. Gently press and blend with fingertips, using the warmth of your fingers to create a seamless finish. If more coverage is desired, lightly layer more product and repeat, blending with fingers. Finish with Secret Brightening Powder for Under Eyes to set concealer and add a brightening effect. Rated 3 out of 5 by chells from Not great for under eyes but good for blemishes I bought this after all the rave reviews! Unfortunately, it has left my eye area very sore and cracked with extremely dry under eyes. It is amazing at covering blemishes on my cheeks and chin but hasn’t agreed with my very sensitive skin around the eye area. Rated 5 out of 5 by Cthomas87 from Lovely and creamy I love this concealer! I am shade Bisque in the fusion foundation and this matches like a dream. It is long wearing and crease free. I would recommend it to everyone who likes a full coverage and brightening concealer. I like the wand it comes with as it helps application go on smooth and then buff out with a brush. Rated 4 out of 5 by Beautyaddict1982 from Good under eye concealer This concealer works really well under the eyes it hides dark circles very well. The texture and consistency make it very easy to apply. I dab on with my fingers very gently and it blends very well. The only reason I gave it 4 stars is because it creased half way through the day and I needed a touch up. I expected it to be more longwear. Rated 4 out of 5 by Sarah450 from Great for under eyes I love this for under the eye, it doesn’t give full complete coverage however it does cover well in a more natural looking finish which is lovely especially for daytime, I set this with the brightening powder and apart from a few creases at the end of the day it wears pretty well. I don’t think there’s as much product in here for the price as there are in other similar concealers but I do like and would repurchase. Rated 4 out of 5 by Anonymous123 from Great concealer This has replaced my nars concealer as this one is more longwear whilst still looking so natural it’s amazing! The only reason I knocked out a star is the shade range. The shade closest to my skin tone is exactly my tone and I like a brighter concealer under my eyes with a shade below being too pale. If they expand the shade range this would be perfect!